The new MOHAI will welcome more than 120,000 visitors annually. The Museum of History & Industry (MOHAI) today announced that it has received a generous gift of $10 million from Jeff Bezos, the founder and chief executive officer of Seattle-based Amazon.com. The grant will be used to establish the “Center for Innovation” at the new MOHAI opening in late fall of 2012 in the historic Naval Reserve Building (Armory) at Lake Union Park, a few blocks from the new Amazon.com campus in the South Lake Union neighborhood. Bezos’ contribution to MOHAI is the largest in the museum’s 59-year history. MOHAI has grown to become the largest private heritage organization in the State of Washington, by collecting, preserving, and presenting the rich history of the Pacific Northwest. MOHAI attracts more than 60,000 visitors annually from the area and beyond, including thousands of school children. Its engaging exhibits and programs, collection of nearly 4 million historic artifacts, archives and photographs, and its award-winning educational programs have created a truly unique appreciation for the Northwest’s diverse cultural, social and economic history. 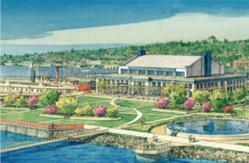 In 2012, MOHAI opens a new museum in the historic Naval Reserve Armory at Lake Union Park. The new museum at Lake Union Park will expand MOHAI’s exhibit space and feature thousands of artifacts and images related to the history of the region as well as galleries for national traveling exhibits and a waterfront café for museum and park visitors. MOHAI will also provide a full range of educational and community meeting spaces at the new museum. The museum is expected to attract over 120,000 visitors a year, including more than 15,000 students and their teachers.